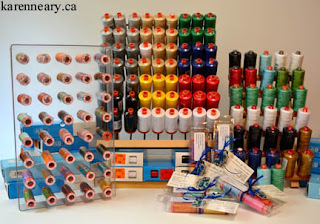 Beth, at Mrs Pugsley's Emporium,has kindly invited me in to display and demo Aurifil thread. So I stitched up this sweet little blue and white quilt, and will take my machine and quilt this in the shop next Friday, February 5. 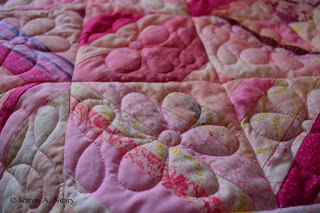 I'll show you the effect of using different weights of thread for your quilting. I will have a variety of Aurifil threads for sale, and will be happy to answer any questions you may have about free-motion quilting. Mrs Pugsley's Emporium is located at 50 Victoria Street, Amherst, NS, right across the street from the downtown Tim Horton's. I will be there Friday from 10-3. Last week on a visit to my sister's, my niece Christina showed me the grown-up colouring book she got for Christmas. The book is the artwork of the very talented Nova Scotian artist, Rachelle Richards, who sketches in a very Zentangle-ish manner. 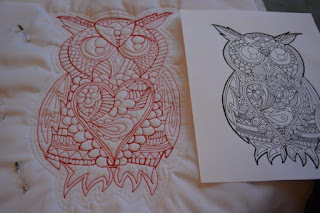 I was particularly taken with this owl, as the loops she had drawn in his feathers reminded me of clam shells; I kept thinking, "I can quilt that!" So I did..using four different weights of Aurifil thread - 12 weight for the shape outlines, and 28, 40, and 50 weights for filler stitching. As you can see, I didn't follow Rachelle's lines, as her drawing is much more detailed than I cared to stitch, but I kept the picture beside me as I worked and stitched the fillers free-hand. What fun! 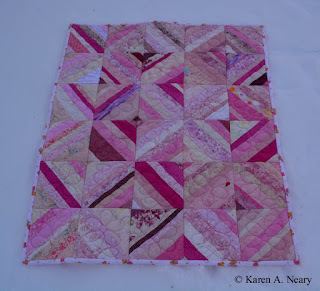 Thanks, Rachelle, for allowing me to play with one of your designs. 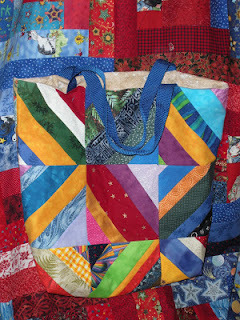 The project is a great way to show off the effect of using different threads - bold to subtle. Mrs Pugsley has invited me to bring the threads, and my machine, to her shop next Friday (February 5th), where I will be stitching up a storm (not literally, I hope!) 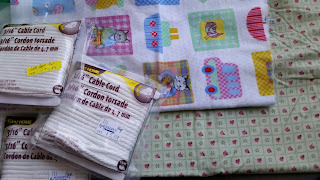 In the next post, I will show you what I will be stitching that day. 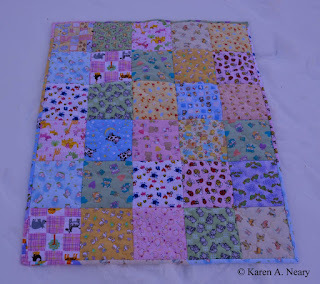 Now...hop on over to Rachelle's Facebook page for some inspiration! 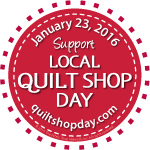 Today is international "Support Your Local Quilt Shop Day". I did my part, at Mrs Pugsley's Emporium. 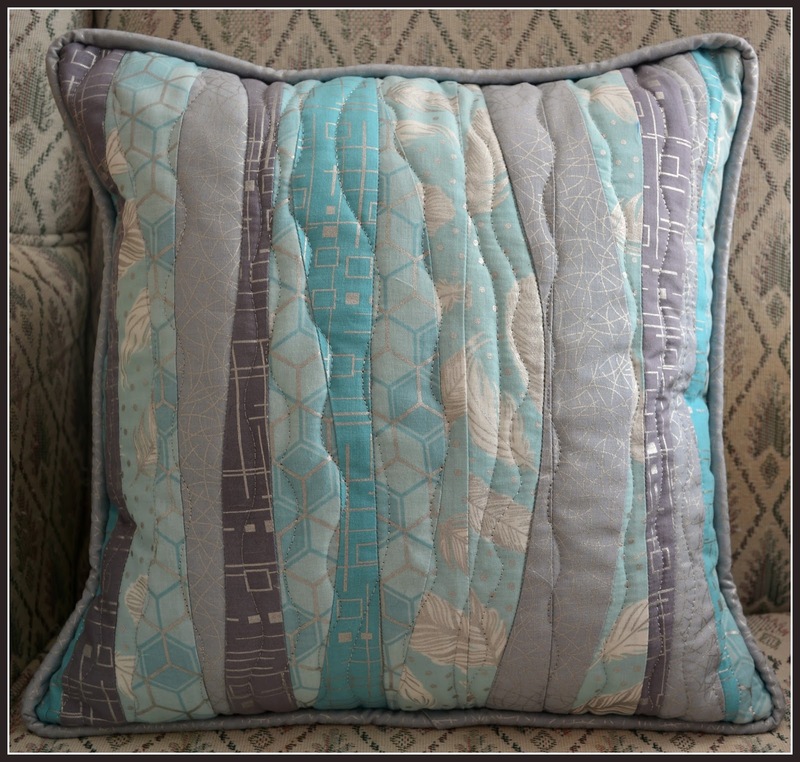 The fabrics from my last post were sewn into this cushion, as sample for a class on Curved Strip-Piecing which I will be teaching during the 2016 Fibre Arts Festival. For the Festival, I am also offering a Beginner String Quilting class. 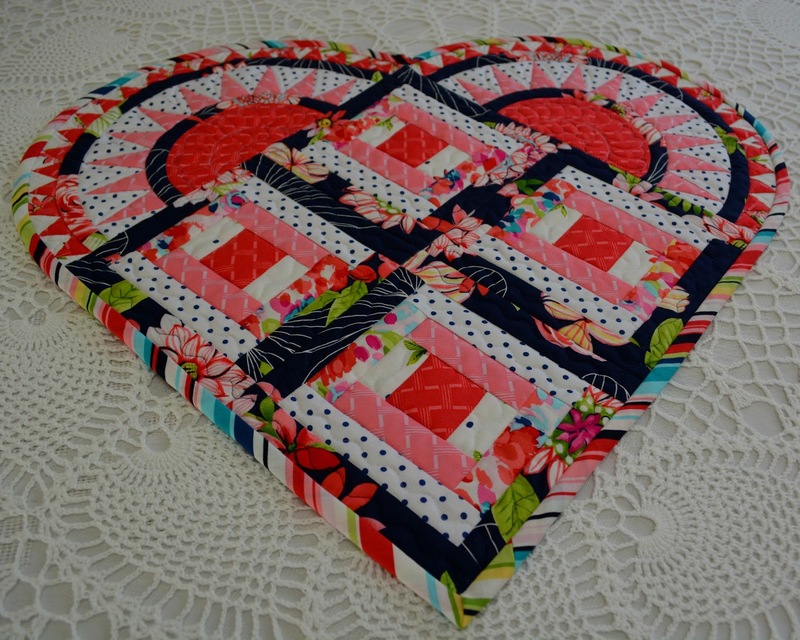 This fun and informal class is appropriate both for beginners wanting to learn patchwork skills, and for more experienced quilters looking for ideas to use up leftover scraps. 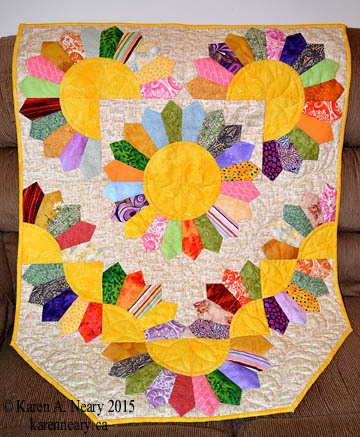 Sewing leftover "strings" of fabric produces charming, traditional quilts in the manner of our frugal grandmothers.Instruction will be provided on how to sew string blocks for use in quilts, or smaller projects such as placemats, aprons, or bags. This class will be held on Wednesday, October 12 from 9 am to 3 pm. You can find more information and register online here. 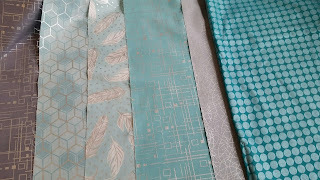 ...so I am playing with the gorgeous fabrics I got yesterday at Mrs Pugsley's Emporium.It's a collection from Hoffman called Clarabelle, in the Mist/Silver colourway. It has a lovely silver sheen. This piece of Mirror Ball Dot from my stash (on the far right) may find its way in there too if the piece needs another dark. We'll see after we start to join the strips. I am alone in the sewing room this morning; my partner, Polly, has tired herself out and had to go back to bed. When the wind blows hard, Polly zooms around the house non-stop like she is possessed. It catches up with her every few hours! 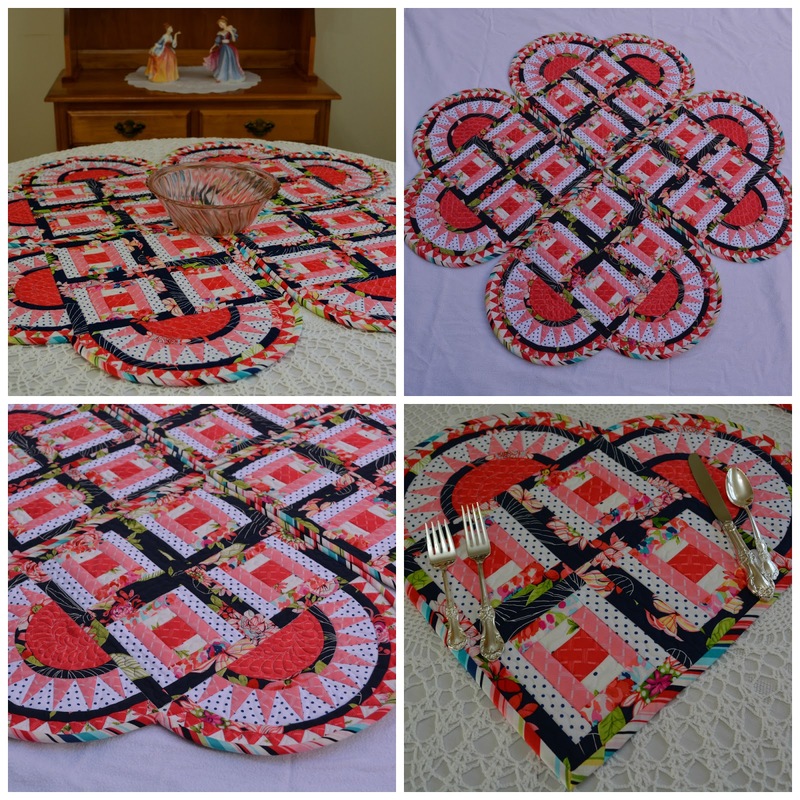 I *do* ♥ NYB's, and these hearts make a clever and unique addition to your table. 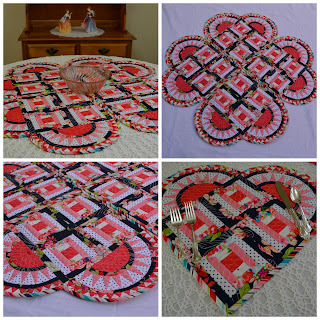 They are actually four, individually bound placemats that fit together to form a very pretty, scalloped centrepiece when not in use. 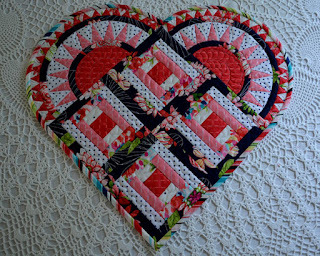 Just in time for you to stitch for Valentines...although I am planning to use mine year round...cos who doesn't like hearts? 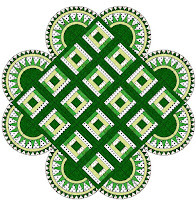 Pieced in greens, it does double duty as a shamrock! 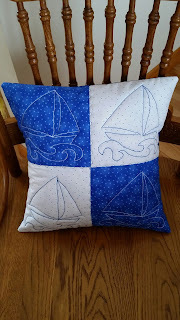 You can download the pattern here...or purchase a printed copy from my website. 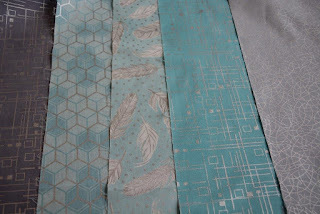 Thank you to pattern testers Darlene Gerber, Kari Lippert, and Lynn Bourgeois. 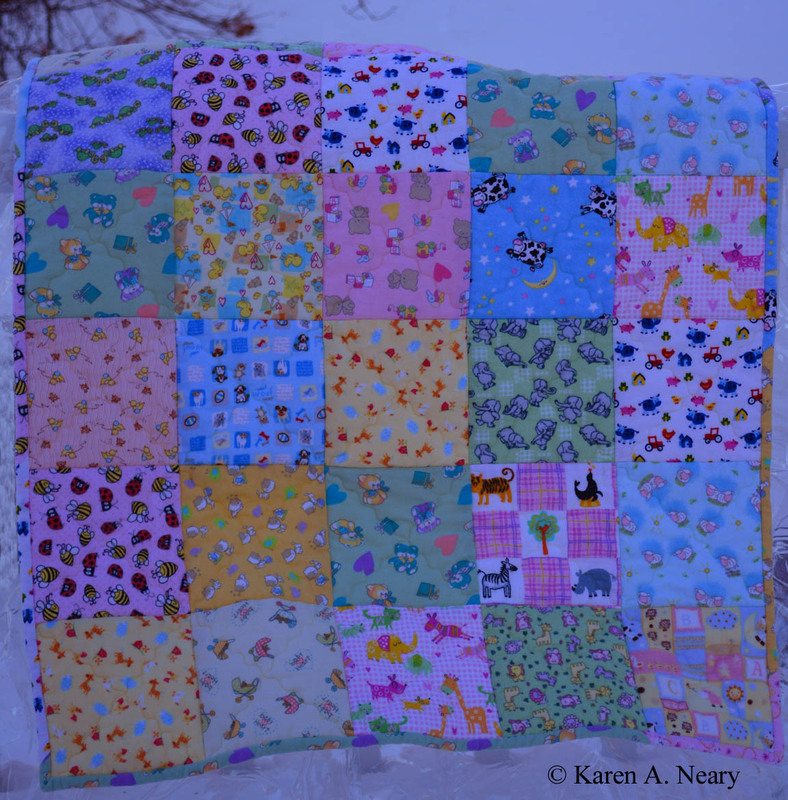 There has been a quilt rattling around in my head for a bit, and the time feels right to translate it into fabric. 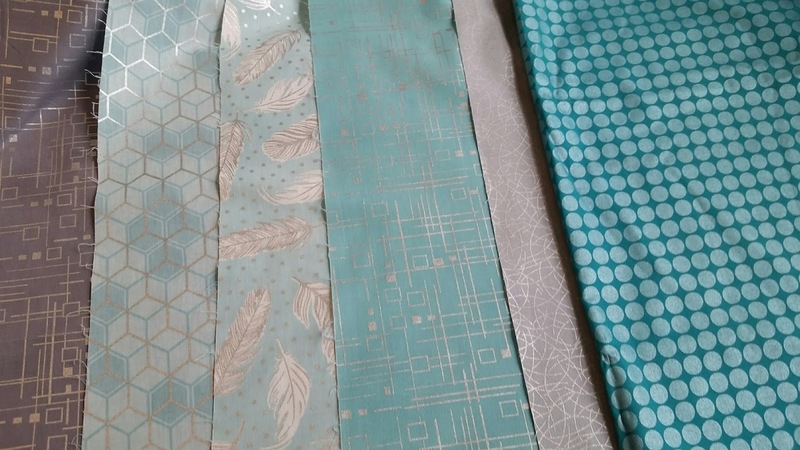 It involves a fair bit of complex piecing and before I start sewing, I like to give it one last "go over" in my head, start to finish, to simplify the patchwork as much as possible. 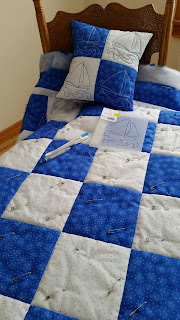 This process is made much easier if there is an actual quilt under my needle; even a very simple one helps me sort out the logic of the seams I will be sewing. 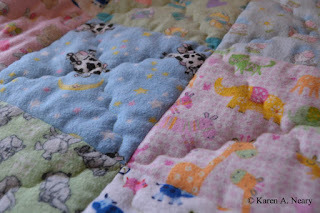 To this end, I've stitched up two baby quilts this week. 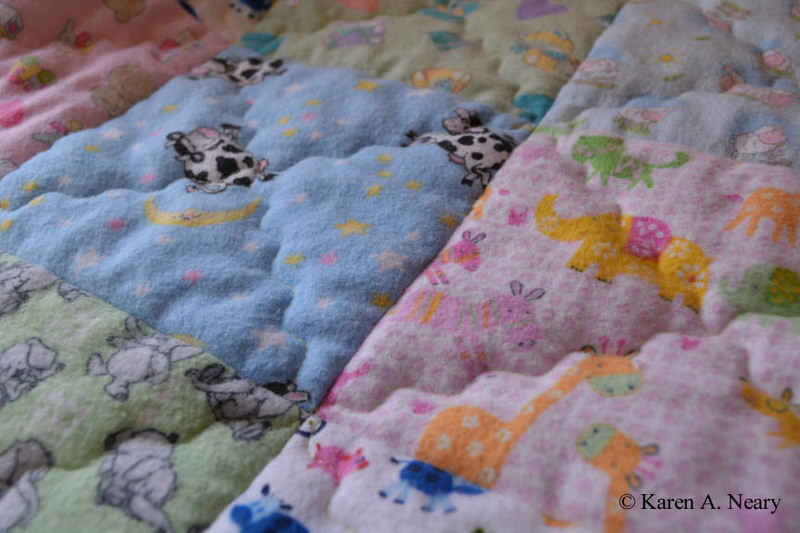 This one is just squares of flannelette, backed and bound with flannelette, to keep it soft and cuddly. I used a 50 weight Aurifil thread for both the piecing and quilting, in a pale yellow. 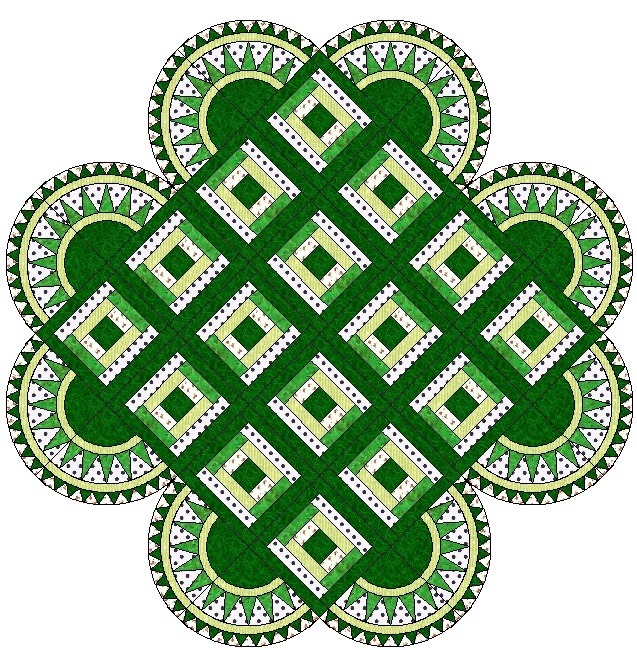 First, all seams were ditched, and then an overall diagonal grid was stitched in a serpentine stitch, with the walking foot. The blocks are only 6", so I didn't mark anything - just eyeballed the line from corner to corner. Baby quilts need just enough quilting to keep them sturdy, not enough to make them stiff. The second is made from pink and rose string blocks. 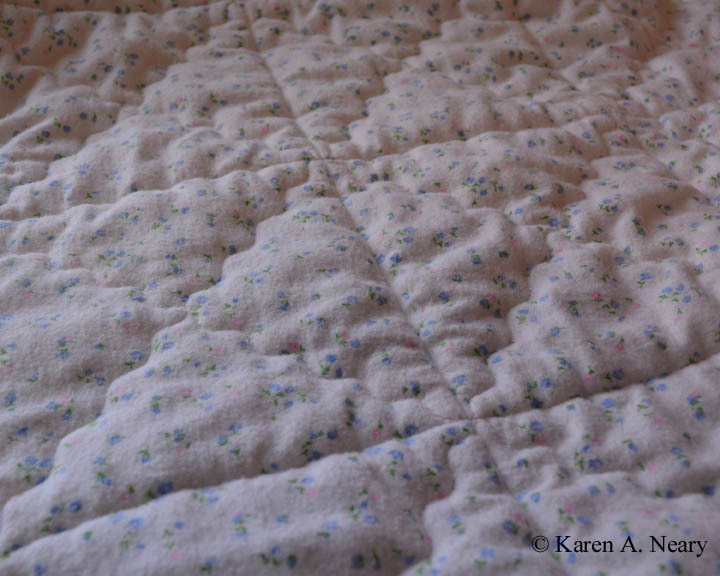 Because there are so many seams, string blocks have a tendency to be a bit flat and stiff, so it was extra important to keep the quilting "fluffy". After stitching in the ditch between the blocks, I free motion quilted a small flower in the centre of each - no echoing, no stippling, just the flower. 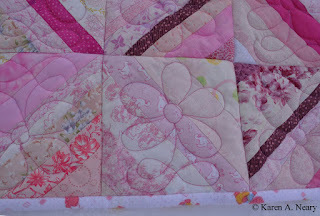 I chose an Aurifil 50 weight in a variegated rose shade, which blended perfectly with the colours in the blocks. I have a personal bias against directional quilts (I can picture OCD me disturbing a sleeping baby because his quilt was put on upside down! 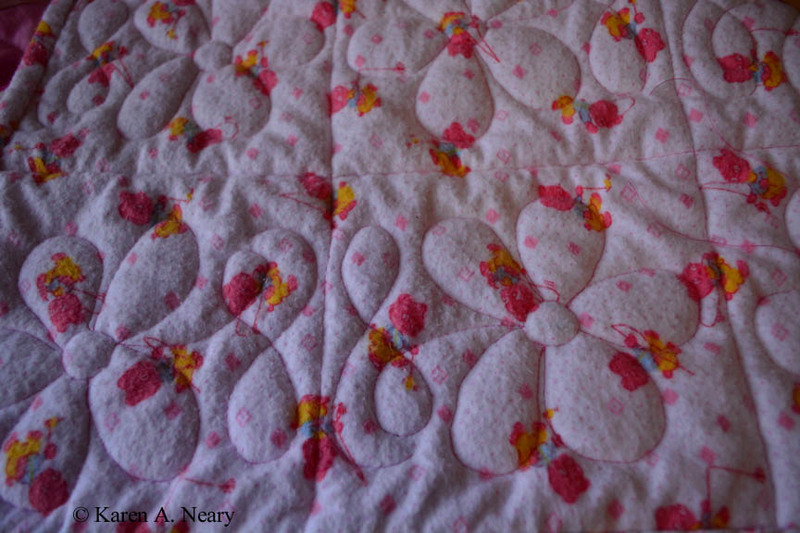 ), So that there was no up or down, I flipped the flowers vertically, end to end, in every other block. I used a cute little stencil from Mrs. P's so that my flowers would be uniform. This one was also backed in flannelette. 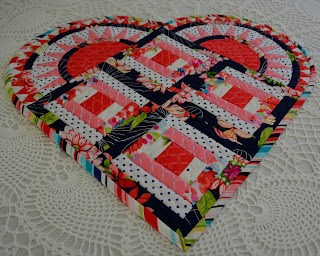 I love making string blocks; they are quick to do and produce lovely, old-fashioned looking quilts. 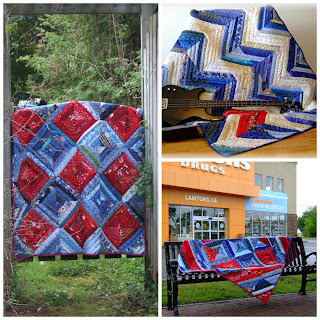 If you've never tried one, I will be teaching a beginner class in October using string blocks, here in Amherst, N.S. Please email (karen at karenneary.ca) if you'd like to reserve a spot. 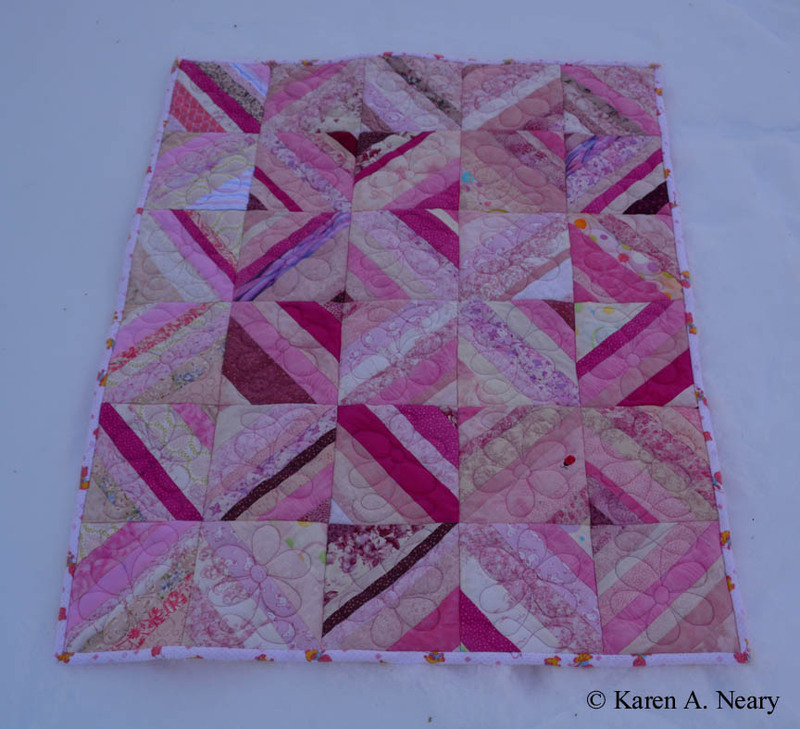 We'll start the new year off with a little Christmas sew-and-tell. This is Wrapped In Love , made by Barbara, who attended one of my trunk shows last year. 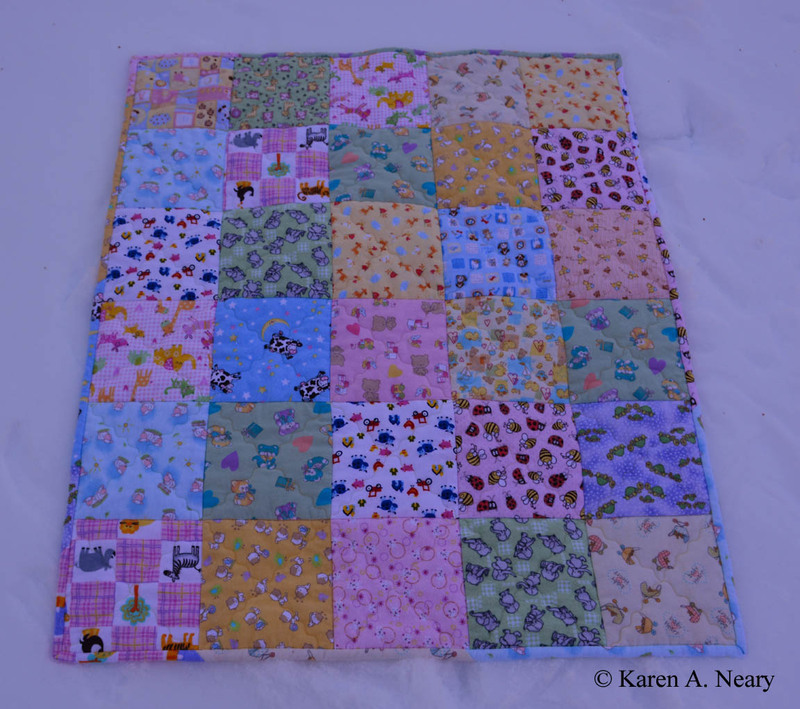 Her quilt is fitting for the name, as she made this as a special gift for her granddaughter. 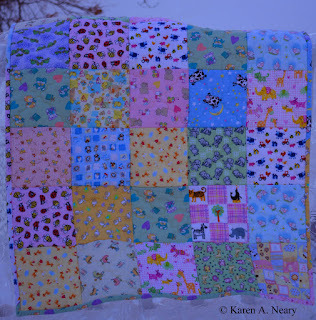 Barbara writes, "I have finally finished the wheelchair quilt for our granddaughter. 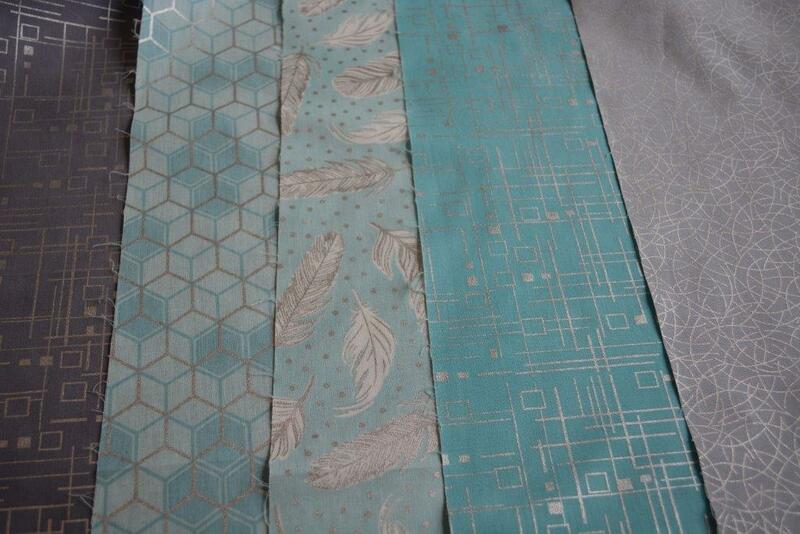 It was really fun deciding on and putting together the material... 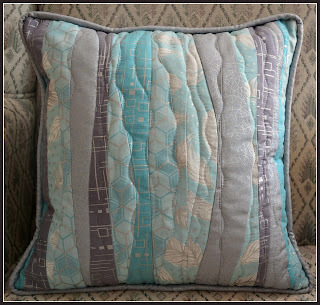 I did a combination of hand and machine quilting to make it more durable and lasting. The back of the quilt is purple flannel and inside the pocket is a bright pink as those are her favourite colours. I am certain she is going to enjoy it and have good use of it." 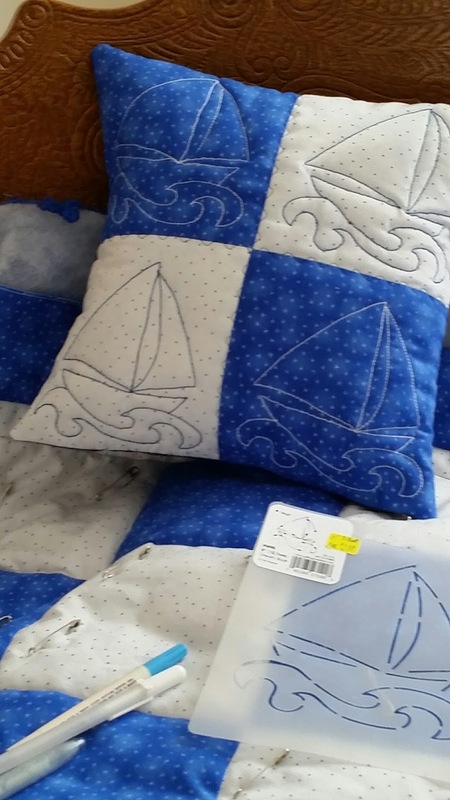 Barbara, I fully expect your granddaughter was thrilled to receive such a special quilt from her gram. Thanks for sharing. You can download the pattern for Wrapped In Love here.